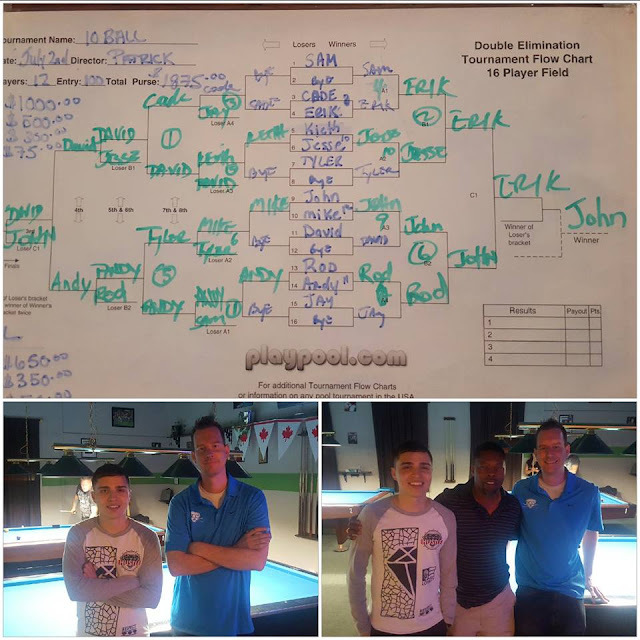 This past Saturday July 2nd On the Snap Billiards in Stoney, Creek Ontario held their second Open non handicapped event of the 2016 season. Entry for players that played in the first event was $75 and $100 for players who did not compete in the first event. It was a race to 8 on the winners side and a race to 6 on the losers side with a two set final. Owner of the room Patrick Peters guaranteed $1000 for first prize and regrettably only 12 players showed up leaving the paid entries at about $1100. At this point Peters could have just made it $1000 for first and $100 for second. However he demonstrated his integrity by deciding to add a fair bit of money making the payouts $1000 for first $500 for second $300 for third and $75 for fourth. This room which opened in 2013 has shown great improvements in the past three years. When I first went there in 2014 the playing conditions were a little skeptical but with a lot of hard work and dedication the conditions are now up to standard and makes playing in this room an enjoyable experience. Favourites on the day were without a doubt world #5 John Morra, myself, Dave parker and Jesse Piercey from London rounded up the next group of players. Home room players included Rod Arsenault and Cade Coats who are always a threat. This brought us down to the winners side final where a lot of safety battles ensued and I came away with an 8-5 win. After losing to Morra in the second round Dave Parker made it all the way back to the losers side final to face him again, only to see Morra bounce back with a 6-2 win. The first set of the final was a little scrappy with neither player being able to put together a strong charge off the break. I made more errors than John and it turned out to be very costly as he would go on to win that set 8-5. In the last set he finally started getting shots off the break a took full advantage, breaking and running 4 of the 6 games he won and took the win easily with a 6 0 win in this winner breaks format. Special thanks to On The Snap for the great hospitality and to Patrick Peters who was very generous in helping out with the prize money. This room has made some major strides since opening and a huge congratulations goes out to them! more tournaments will be planned in the fall.